A special day for special athletes! 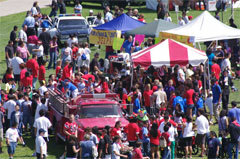 …is the largest event of its kind held in Orange County, CA. A small CSUF school project has now grown to include thousands of developmentally disabled students of all disabilities from schools in Orange County who participate in a day of non-competitive games each year. It is expected that 2,500 special athletes and over 4,000 volunteers will attend. Athletes will be paired with a high school volunteer buddy to make the day a rewarding experience! There is no charge for schools to attend. The CSUF Special Games is a grassroots effort with all donations going directly to support the event for the benefit of disabled children in Orange County. See you on the field! 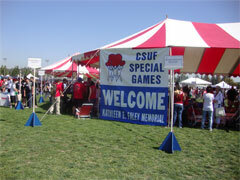 The CSUF Special Games Mission is…. • Dedicated to fostering social development and activity for developmentally disabled children through non-competitive sporting games and interaction with other challenged children. 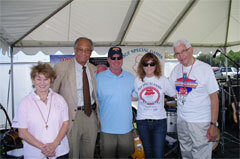 • Committed to the endeavors of the special games and include local community schools. • Founded on the principals of volunteerism and community spirit and provides a day filled with fun, joy, and safety for both the special athletes and the volunteers. • Committed to maintaining a successful day of fun, friendship and non-competitive games. FULLERTON, Calif. – April 29, 2016 – Goodwill of Orange County and California State University, Fullerton (CSUF) have teamed up to expand and continue the Cal State Fullerton Special Games, Kathleen E. & Jack Faley Memorial, Orange County’s largest non-competitive sporting event for athletes with developmental disabilities. The games will be renamed Goodwill of Orange County Faley Special Games. The event will be hosted at Cal State Fullerton. The Special Games changes lives- read how! I want to add my voice to the grateful group of parents who are already thanking you for the wonderful job you all did yesterday at Cal. State Fullerton. My daughter is a 5th-grader with special needs and she was able to participate in the games for the first time this year. She attends Montevideo Elementary School in Mission Viejo. I was a little concerned about sending her that morning -- it was slated to be a hot day and sometimes crowds overwhelm her. But I shouldn't have worried. She had the time of her life. Special thanks to her high school "buddy" who selflessly spent about four hours taking Lindsey around to all the sports and games. Lindsey ran the 50-yard dash, shot baskets, tossed bean bags, and more. Her teacher actually called me after school to tell me how much Lindsey connected with the activities and what a special day it was for her. She was all smiles all afternoon and evening. Of course, she slept great! Sincere thanks for your dedication to this special group of kids. You gave my daughter a wonderful gift. Last year all of our students in the Special Day Class (SDC) were able to attend and had an amazing time. Our Special Education Teachers were so thankful that not only our kids had a lot of fun, but more important that they were welcome and accepted for whom they are. I actually work at RH Dana ENF and have been to the Fullerton games many years with the children from our school. I have seen what a great day everyone has... I don't think anyone can participate and not be changed. The CSUF Special Games were once again a success- with lots of smiling athletes! 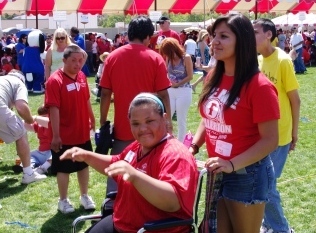 The fields were filled with special athletes, volunteers, vendors, field marshals, etc…. All fields were jammed with kids! The track & field area had the 50 yard dash, soccer kick, volleyball with large blown up beach balls, bean bag toss, large parachute and the inner field had football toss, T-ball in four corners, soccer relay around cones, more soccer kicks, and basketball hoop shots. Many children were dancing to the band or getting balloons from the clowns. The kids really enjoyed petting the dogs from the Pet Prescriptions Team. Lunch was promptly served at 11AM and the opening ceremonies were conducted by Mr. Ed Arnold. Again, a huge thank you to the FULLERTON COLLEGE FOOTBALL TEAM and Coaches for their Thursday (pre-game day) help setting up!!! They worked very hard in the hot afternoon sun to help us get the entire field, kitchen, games, etc.. prepared and set for Games Day! NEW THIS YEAR- Due to new regulations, each person must be registered to volunteer through a school, campus group or organization in order to receive a badge and participate. Walk-on volunteers will no longer be allowed to participate. Your donation in any amount helps the Special Games continue year after year!